How to Create a Stocked Pantry for Emergencies. Having a well stocked pantry is so important! You never know what’s going to happen financially or even weather wise that might prevent you from being able to buy groceries. A well stocked pantry gives me a sense of security because I know I’ll be able to feed my family should something unfortunate happen. How long depends on how well stocked your pantry is (but something is better than nothing). The concept of building your pantry or stockpiling can be daunting (especially if you’re thinking of Extreme Couponing Stockpiling 🙂 ). But it’s really not complicated at all to get started! Mine is a more realistic approach to building your pantry! 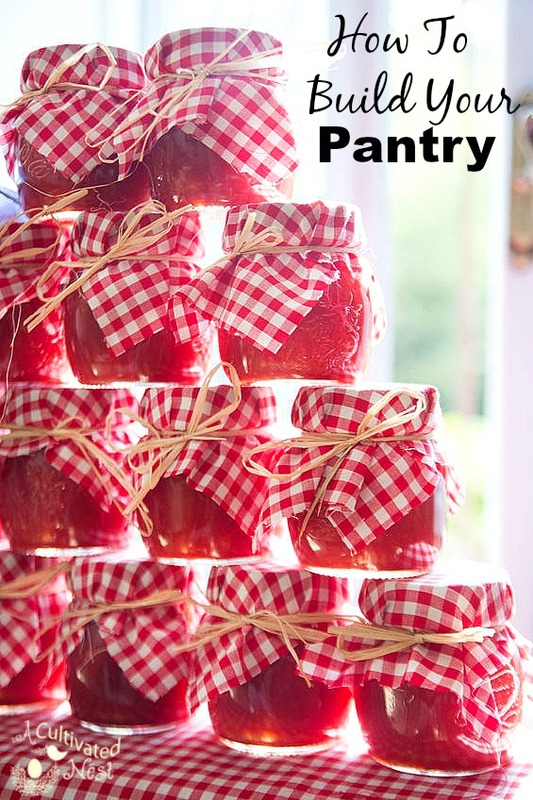 Here is How to Have a Well Stocked Pantry! A well stocked pantry is also really helpful even when nothing bad is happening. Having a pantry stockpile means I’m able to wait in between sale periods to buy dry/canned foods, instead of being forced to pay whatever the current price is because I’m out of something. 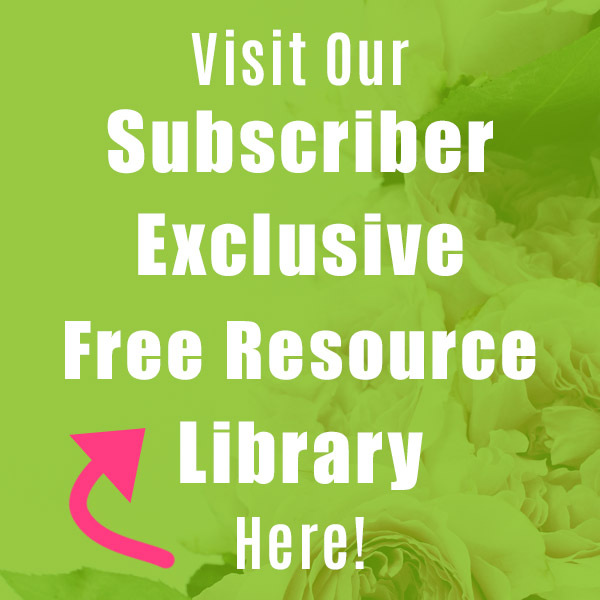 So if you want to get your grocery budget under control, you need to fill up your pantry! Just take it nice and slow in the beginning and follow these steps. Remember everything new requires a learning period so give yourself some time to get the hang of building your pantry/stockpile. To begin building up your pantry or creating a stockpile, you should probably understand what a stockpile is. 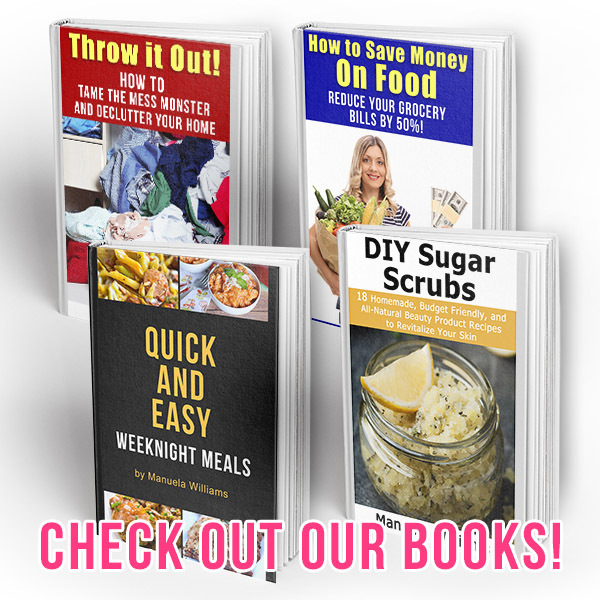 A great way to explain stockpiling is that you’re building up a supply of items that your family normally eats or uses when you find those items extremely cheap. You may not need everything at the moment, but you’re prepping for the long haul. When it comes to stockpiling, you should know what you need product and food wise. Take an inventory of your pantry and make a list of what you’d like to stockpile and go from there. That way you’ll know that you already have 10 cans of tomatoes and maybe you’ve determined that’s enough. Or maybe you’ve decided that 10 cans is not enough and you need 10 more! Figure out a quantity that will work for your family (and your budget). 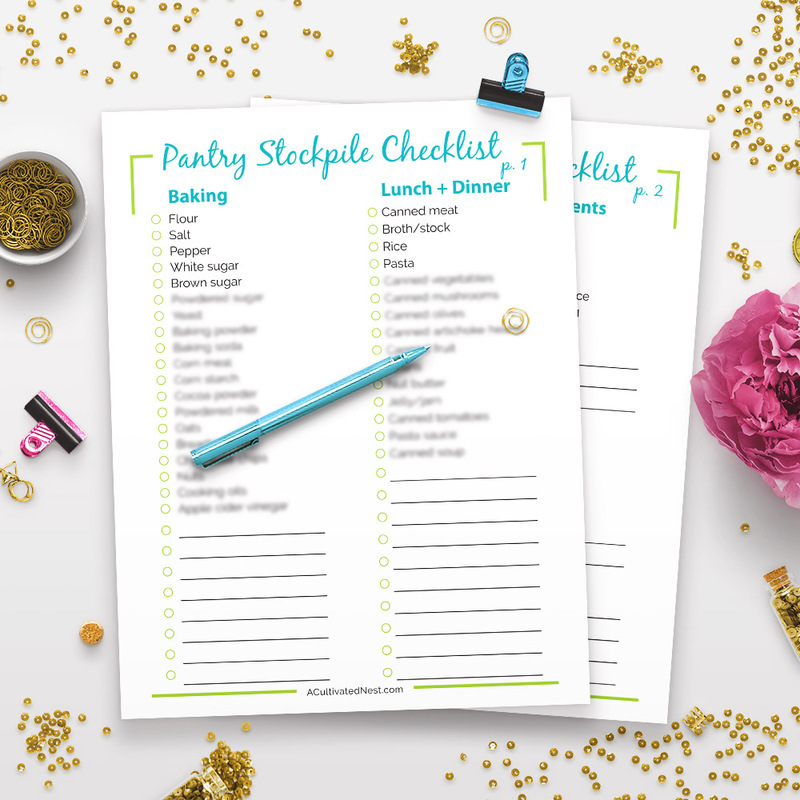 An even easier way of figuring out what you need to stockpile is just to use our printable pantry stockpile checklist! It has two pages that are pre-filled with suggestions, plus has plenty of space for you to write in other things your family may need. You are going to need a place to put your stockpile. Find a place in your kitchen, basement, under the bed, or in the garage that will house the extra items you’ll be buying. Repurpose a linen closet or a utility closet like I did (see My New Pantry & How I Organized It). Get creative! It’s best to keep this area as organized as possible from the get go. #1. 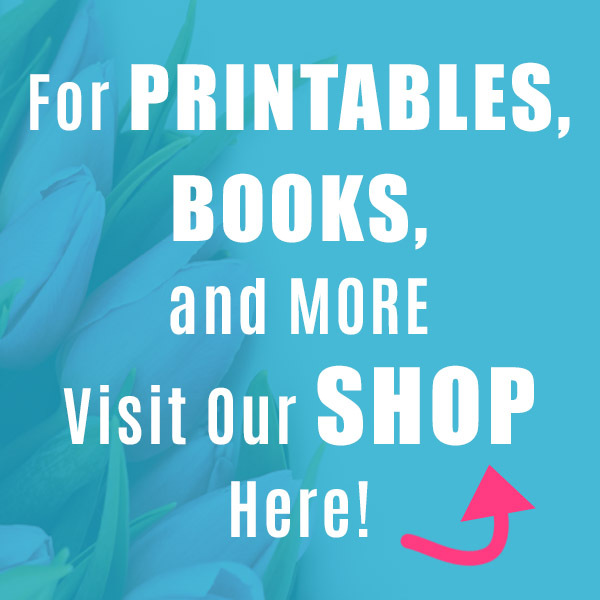 Sales – Get your items at rock bottom prices! You’ll want to have an idea of when sales happen in your area (usually every 6-12 weeks) and what your best price is. A price book is a great way to track that! Here’s my post on how to set up a price book. Or to keep it super easy, you can just take advantage of advertised weekly deals. #2. Coupons – You might want to use coupons when items are on sale to get the best price. For example: if you have a $1 coupon for a box of macaroni & cheese and the item goes on sale for $1, this is a great item to stock up on. I don’t use a lot of coupons but the ones I do use are organized in such a way that it’s easy for me to use them. Here is my post on How I Organize My Coupons. Even if you don’t eat products that you usually find coupons for, most people still buy toilet paper, toothpaste, deodorant etc. So use your coupons to stockpile these things. You can also use a rebate app like Ibotta to save money after you shop. #3. Obtaining Coupons – There are several ways you can obtain coupons. Printing off coupons, downloading coupons onto frequent shopper cards and purchasing your local newspaper are the most common ways to get coupons. Of course, you can also ask family and friends if they are going to use the coupons they have. Collect as many coupons as you can for the things your family normally eats. #4. Price match in stores that have this policy. Since you are still going to be doing your normal grocery shopping, you’ll have to decide how much of your grocery budget you can set aside for the purpose of stocking up if you can’t add additional money. Can you use $5-10 of your regular grocery budget just for stocking up? Or perhaps you can only buy 1 or 2 extra things each time you shop. Maybe your grocery budget is already really tight – then you need to think about ways to make some wiggle room. Maybe you need to plan for more vegetarian meals in order to squeeze some extra money out of the grocery budget for stocking up. Perhaps do a no spend weekend or cut back in other areas. Maybe you need to sell something to get a bit of extra stock up money. You can get cash fast if you sell your old electronics. Some people allocate a portion of their tax return or bonus for stocking up. However you decide to handle this, do set yourself a limit for stockpiling and don’t go over budget. 1. Mark the expiration date on each item with a marker if you can’t easily see the expiration date stamped on the item. 3. Rotate your stock. Since you will be buying several items of the same type, you’ll want to have a good rotation practice in place. Keep the oldest items towards the front and the newest items in the back. Part of rotating is paying attention to the expiration dates. Having a pantry full of food and other products on hand will give you peace of mind! No matter what happens to your finances, health, or local weather, you’ll be able to keep your family fed and stocked with the basic necessities. What’s your pantry like? 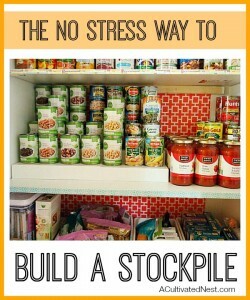 Do you keep a stockpile of food and other items? My Pantry isn’t that neat but I keep it well stocked:) I watch the sales and buy the items I use and lots of them! Enjoy your day dear friend, I always enjoy your tips! HUGS! I nearly always keep extra on hand. I especially do so in the Fall to prepare for the Winter. Not only food items, but personal items, tissue, etc., and have been doing so for many years. I love the idea of being prepared for whatever happens. We stock up on good sized bags of rice, olive oil, canned tomatoes, pastas, t.p. paper towels, etc. when we shop at Sam’s club. We’re vegetarians so the harvest from the garden is important as well. 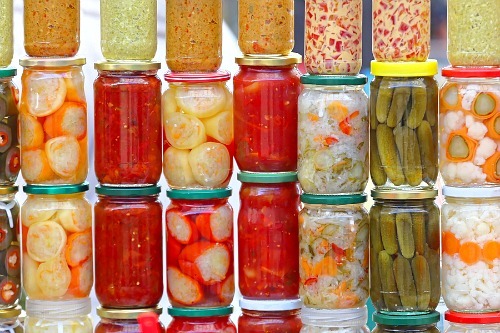 I have so much to learn from the pros as far as preserving vegetables beyond the freezer. Buying and learning how to use a dehydrator would be an asset. I don’t have a dishwasher and I feel washing the canning jars in a dishwasher is incredibly important for sterilization. Maybe this year we will take the plunge. 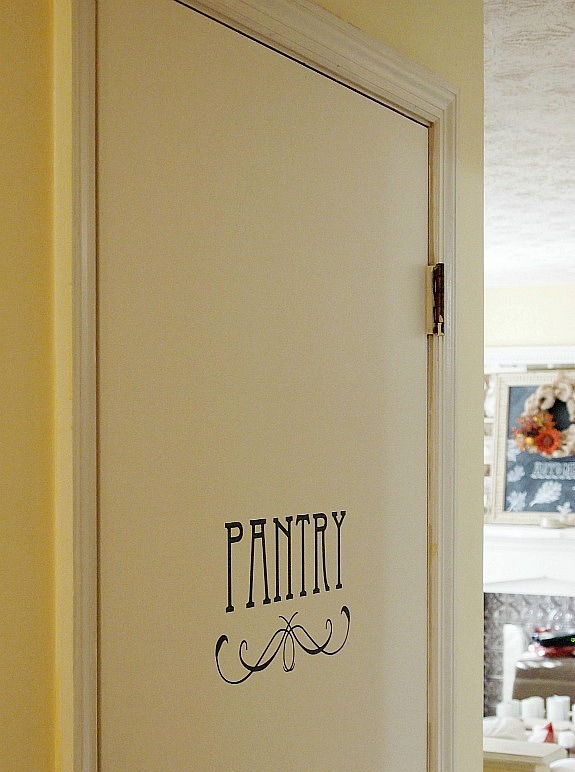 I could use a walk in pantry. That would be a plus for organization. The pantry closet is a controlled mess right now. I am the world’s worst at this. I generally have good intentions, but after a while I stop stockpiling and the stuff goes bad. My sister is excellent at it, and I really want to do better. I would love to be as confident about stuff like hurricanes and ice storms as she is. 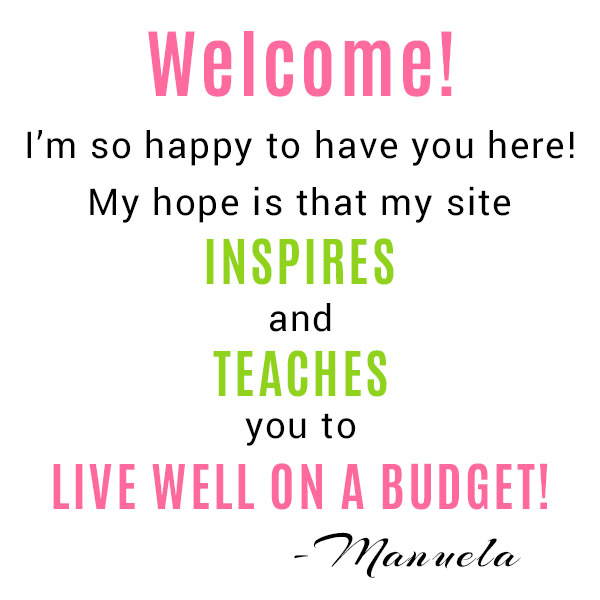 I always enjoy your tips Manuela and appreciate the amount of work you put I to each and every post! As I was reading this and read the comments I’m thinking that perhaps stockpiling is perhaps done most by people who live in rural areas or areas prone to very poor weather. While I’ve sometimes bought more food than needed because it’s on sale, I wouldn’t consider buying food in preparation for a time when I couldn’t get to a store. If I did I think a lot of food would end up getting spoiled and wasted. Your food would only spoil if it’s perishable and you don’t stockpile perishable unless you have the right way to store it (like potatoes, apples, oranges, flour even). 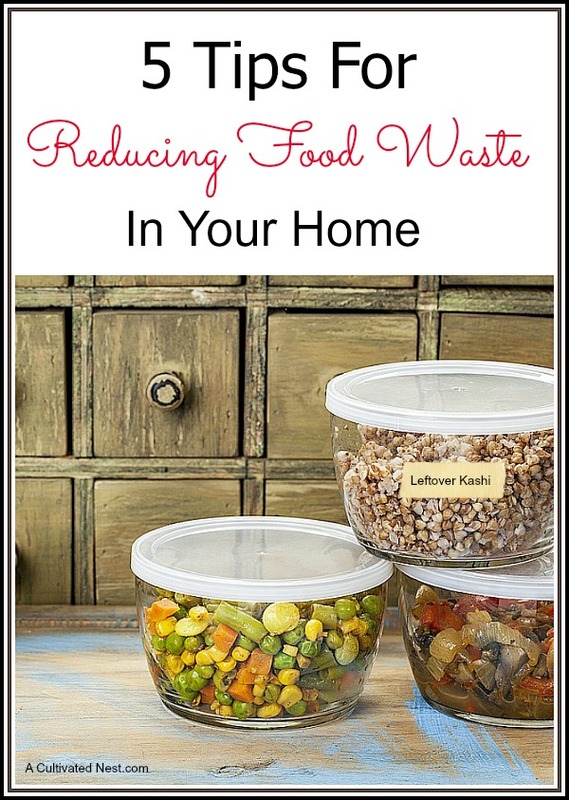 It also wouldn’t spoil because you only stockpile food that you normally eat anyway so you would be using your stockpile at the same time as you replenish it. It’s not stockpiling in the sense of a prepper stockpiling for the end of the world. When my husband was downsized in 2007 I was very grateful that I had enough food in my pantry to feed us for a few months if I needed to. There is one blogger who fed her family for a year on her stockpile when the economy tanked and her husband was basically making enough to pay the mortagage and utilities (real estate). I do keep a pantry. Some I have in a freestanding cupboard in the kitchen and the rest is on some shelves in the basement. My kitchen pantry needs some organizing. I have been buying ingredients for doing THM and I need to get it all together! I like yours. Lots of space. THM? Trim Healthy Momma? The things I keep in my pantry has definitely changed over the years as our eating habits have changed. Packing, packing, packing! We move into the new house on oct. 15 and our closing on this house is the 22nd! So just a few more weeks! Plus I have to have at least one garage sale. 17 years in one house and we’ve accumulated way to much stuff! I’m really happy about being forced to downsize things and I’m looking forward to starting out in the new house more organized! While my apt. pantry was very small, the pantry in my new house is much bigger. I will be coming to your site often to learn how to stockpile.